The key question is not who started it, but what started it. At a general level, the short answer is: the collective and historical experience of the working class and its associated movement in the Hunter Valley and beyond. Though precious little of the early period was recorded, it was enough to spark the imagination of a few crucial people. Two incidents may help to illustrate this. In the mid-late 19th century, in the Hunter Valley, striking workers would sing militant songs to confront scabs while at the same time other family members would be beating on kettles, pots and pans to make loud noise. This was called 'tin kettling'. The combined effect was to instil fear in the scabs. Later, in 1936, there was a meeting of trade unionists in Newcastle Town Hall that called for the formation of a workers' choir. This was apparently after a particularly bad rendition of "The International" by the gathered workers. Decades after the 1936 incident there was still no workers' choir in Newcastle and only a few people seemed to know how to sing important working class songs right through (or in tune). However, to be fair to the past Left-wing movement, there was a Trade Union Choir operating in Newcastle in early 1944, associated with the then Labour College attached to the Trades Hall. There is however no evidence that it lasted more than a year or two. Throw into this historical mix a bunch of people in the 1980s who were passionate about keeping the militant tradition alive, had a connection to folk music and left wing politics, and there you have it. That's what started the Newcastle People's Chorus in 1988 - an historical collective consciousness combined with a practical need. As mentioned, in the 1980s there were a few left wing people who knew a chorus and maybe one verse of famous songs like the 'Red Flag', 'Internationale' & 'Solidarity Forever', but there was always trouble starting on the right note with the result that the song would begin to come to a halt as fewer and fewer people could reach the right notes. This was an unacceptable situation to a number of people. Finally when enough interest was gained to form a choir a meeting was organised in July 1988 at Trades Hall and attended by about six people (there were a few apologies). At that meeting it was proposed that a "People's Chorus" be formed. This was readily agreed to because everyone present knew that was what they were there for. Some of the first members were John Day, Len Coates, Dave Marley and Rod Noble. We approached Julia Robertson to be our conductor and knock us into some shape to be able to sing, and so our first rehearsals begun in the Newcastle Workers Club (now Panthers). It came from researching labour cultural history in an early 1940s edition of the left wing newspaper the 'Tribune'. It mentioned the existence of a Balmain People's Chorus - a left wing song group at that time. It was put to the founding members and was accepted. Where was our first performance? The first performance was at the opening of the "No Easy Road" Labour History Exhibition of photos and memorabilia, in October 1988, at the Regional Museum which was then in Hunter Street (West), Newcastle. There were only about eight or nine of us singing including the conductor Julia and a couple of the singers from the local group, the "Mujets". However, it was a well attended event and our enthusiasm must have rubbed off because we nearly doubled the numbers in the following few months. For us it showed that with a little bit of practice we could be the People's Voice. It was a great boost to our confidence and we have never looked back. We were singing in unison in those days, not in parts. Were we the only workers' choir? At that time (1988) we thought we were the only union choir in Australia. Significant influences at the time were the UK group the 'Flying Pickets' as well as Paul Simon's album 'Gracelands' which came out in 1986 and had great choir harmonies on some of the songs. Not long after we formed we heard that there was a 'Solidarity' Choir in Sydney that had formed in 1987 and which was orientated particularly towards solidarity with the South African liberation struggle. We were different but both were nevertheless politically left wing. 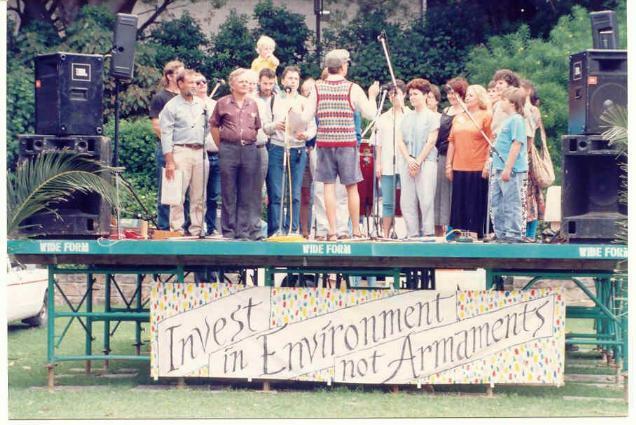 It was only later in 1988 that we found out that there was another union based choir in Brisbane - the Combined Unions' Choir that had also started in 1988. Our relationship with these choirs started in 1989. 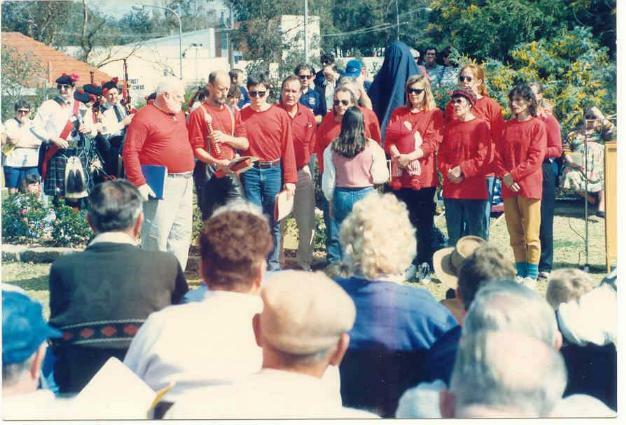 We linked up with the Brisbane Combined Unions' Choir in August 1989 in Coffs Harbour and with the Solidarity Choir in December 1989 at Catherine Hill Bay. By the mid 1990s there were about 9 union choirs in Australia, and in 1996-97 a loose organisation called Australian Union Choirs (AUC) was formed with a charter.